Gilberte Interiors, Inc. Walk The Prouty - Gilberte Interiors, Inc.
Over the years our family has been involved in The Prouty™ in many ways. During the early years of the event my husband, Neil, and son Nathan biked, while our daughter Morgan and I served as their support team. 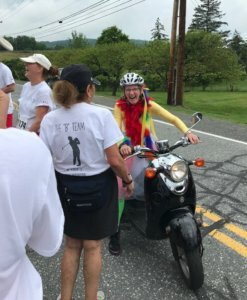 As The Prouty options expanded, we all participated in our own ways: biking, rowing, and walking with different teams before our business, Gilberte Interiors, became a corporate sponsor. Our family’s connection to the organization grew as Nathan joined The Prouty team for two summers as an intern. Each year he encouraged our family to participate, including his grandfather Andy Boghosian, who volunteered at the information tents in 2016. Nathan knew Andy’s natural ability to connect with people and love of conversation made him a perfect fit for the job! Early in 2017 Andy passed away and, although not a cancer patient himself, he always supported The Prouty, DHMC, and the Upper Valley community he was a part of for over 50 years. 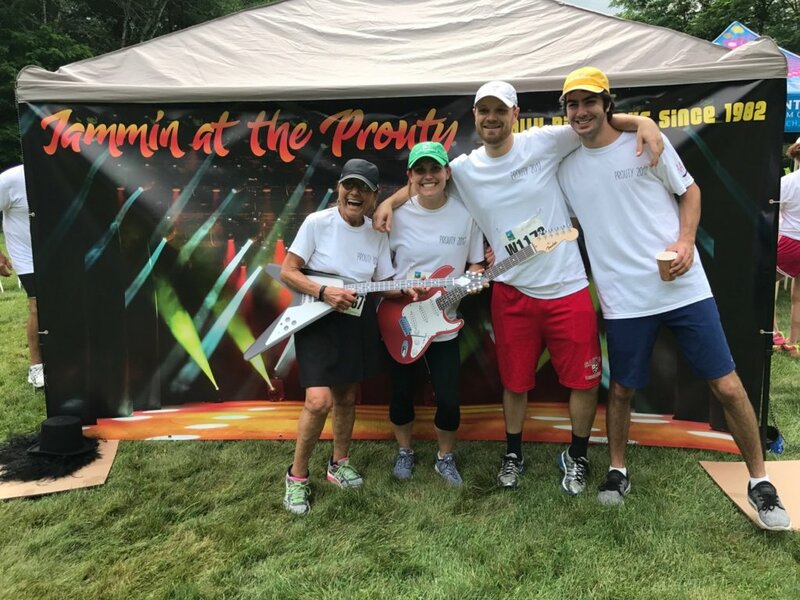 This year, in his honor, we formed “The B Team” to participate in Walk The Prouty, giving our family a special opportunity to continue supporting The Prouty while helping us find our way through this loss together. Early Prouty morning, our extended family and friends convened at our home to slip on our team shirts. We headed to the start feeling excited and happy to be together, knowing Andy would have been filled with pride at our support of this charity. Within the first mile of the walk, we passed by the practice area of the Hanover Country Club Golf Course where a memorial bench had recently been placed for Andy. As I stood and watched our family—the grandchildren and cousins¬—gathering around the bench, I was reminded of our loss but also of the strength that we can bring each other. Our 12k walk blended new and old friends, sharing stories, support, and smiles. As I listened to others talk about the ways in which they’d overcome difficult challenges, I realized that all those who came together were not only supporting patients of Norris Cotton Cancer Center but also strengthening our community and helping our family navigate through this journey.